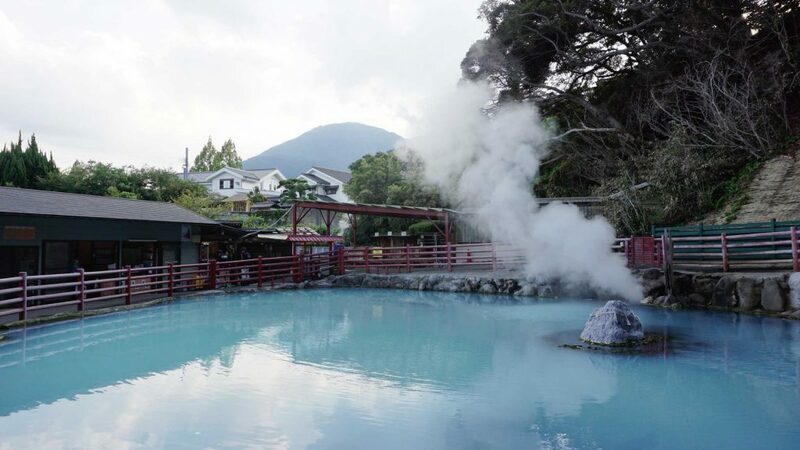 Beppu Japan – Regarded by the Japanese as the most famous hot spring resort area, Beppu City is a paradise for those who are seeking a respite from the cityscape. Located on the east coast of Kyushu, this region produces more hot spring water than any other resort in the country, which basically translates to a wide range of baths to last you a lifetime! 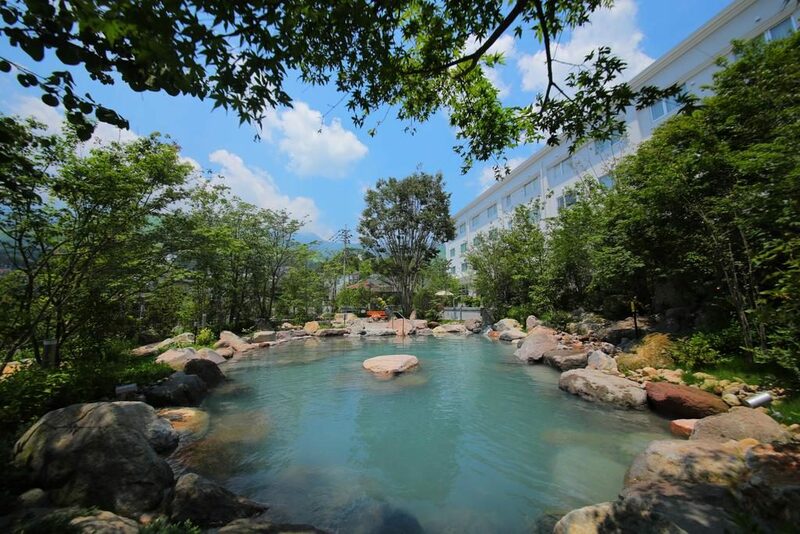 From ordinary hot spring baths to mud baths, sand baths, and steam baths, every hot spring experience will be an experience, if you know what we mean! Another one of the more popular things that Beppu has to offer, and it’s arguable that it may be even more famous that the hot spring baths themselves, is the Hells of Beppu, a collection of hot springs that reach boiling points (as a result of surrounding volcanic activity), and are for observing rather than bathing in. Each of the pools are an exciting attraction, as they each have varying characteristics that people will notice even from far away. Beppu is also a region full of gorgeous natural scenery (mountains in the background and beaches just a few hours away), and it’ll have you breathing in a breath of fresh air every day as you wake up. The time is slow, the food is fantastic, and after your sixth hot spring visit, you’ll almost want to pack up and move there. Beppu Japan – How To Get There? Beppu City is quite easy to access, with both flights and trains heading straight there from Tokyo and Osaka. Which method is best for you will depend on the dates you’re traveling, as well as your budget and time constraints. From Tokyo, you can get a flight to Oita Airport (which is roughly a 1-hour train ride to Beppu City), from Narita Airport from 6,370 one-way with Jetstar Airlines. The flight is just under 2-hours. Other airlines such as JAL and ANA also flight to Oita Airport (from Haneda Airport), but the cost is significantly more expensive, with flights starting at 20,290 yen. You can also take the Tokaido/Sanyo Shinkansen from Tokyo to Kokura Station, and then transfer to the Sonic limited express train for Beppu. This trip will take roughly 6-hours and costs roughly 25,000 yen. If you hold a JR pass, this trip is included on your pass, however, you cannot take the Nozomi trains on the Tokaido/Sanyo Shinkansens; you will need to travel by Hikari or Sakura trains, which require an additional transfer at Shin-Osaka Station. From Osaka, you can get a 1-hour flight to Oita Airport from 10,500 yen with both ANA and JAL. 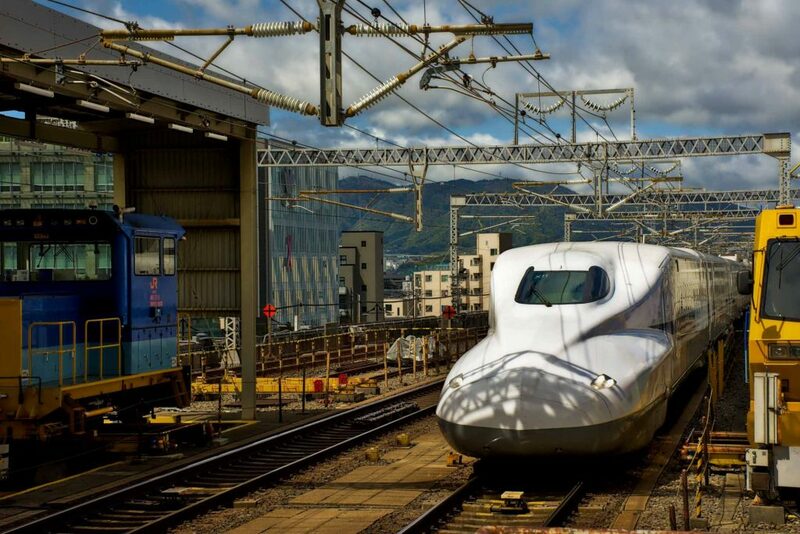 Otherwise, you can catch the Sanyo Shinkansen from Shin Osaka Station to Kokura Station, and transfer to the Sonic Limited Express train for Beppu. The trip will take roughly 3.5 hours and cost around 17,000 yen but again, it’s included in the JR pass. Located just a 10-minute drive from JR Beppu Daigaku Station, this guesthouse is convenience wrapped up in a budget-friendly package for those seeking comfortable accommodation at a comfortable price. 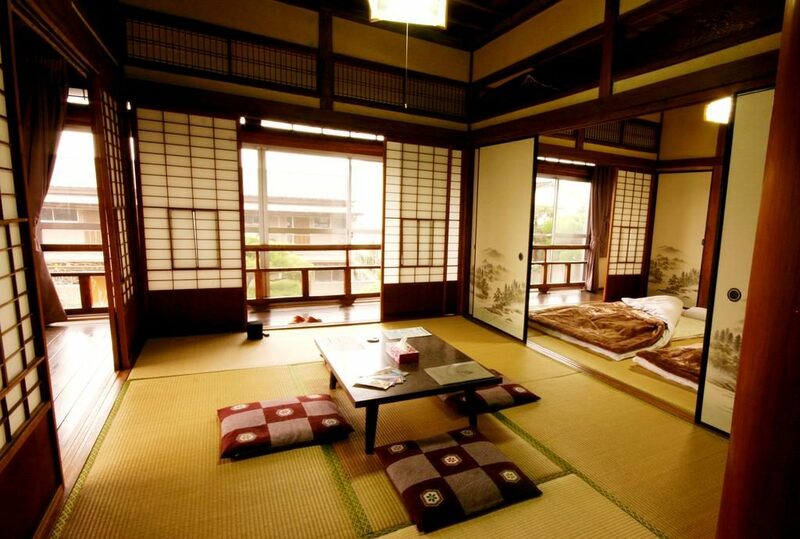 The rooms are Japanese-style, meaning minimal furniture, tatami mats, and futon bedding with lots of natural light. However, Wi-Fi is available throughout the entire accommodation, and they’ve even thrown in a free one-way complimentary transfer to or from Beppu Station, Beppu Daigaku Station, Beppu Hotsu Center, or the Ferry Terminal. 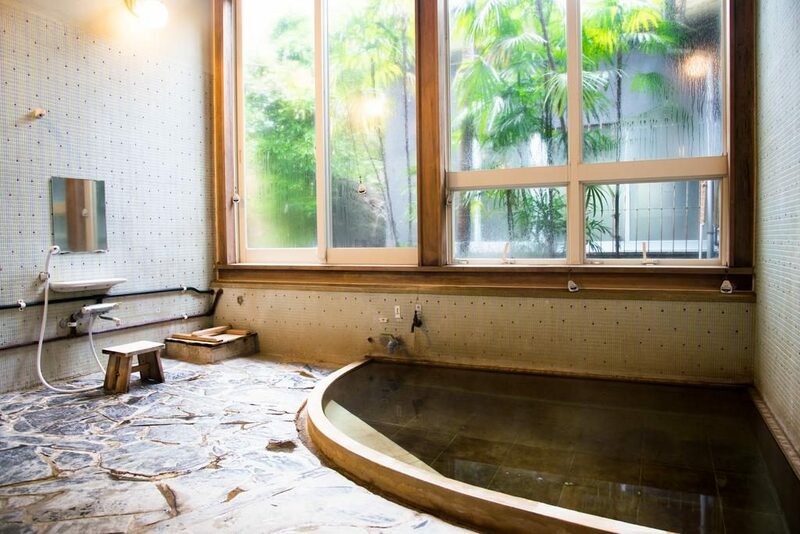 Why Guests Love It: “Located right in the middle of Kannawa Onsen. The room is very comfortable and has a fully equipped kitchen and laundry area. Plenty of shops and restaurants nearby”, “I liked how it was off the main tourist spots (but still very close) so when we wandered around it was really peaceful”, “The house and the rooms are beautiful and clean. The owner is helpful and accommodating. The area is perfect for seeing the sights in Beppu”. A conveniently located accommodation with a stunning surrounding garden, Morinoyu Resort is where you’d want to stay if you want close, easy access to attractions such as the Hells of Beppu, Yama Jigoku, and Jigokumushikobo Kannawa. There is a hot spring bath located on-site, and each room features a flat-screen TV and a private bathroom. You can indulge in a buffet or international a la carte breakfast at the hotel before heading out for the day as well! Why Guests Love It: “The hotel is amazing and brand new. The Onsen is incredible and the outside bath is completely off the charts”, “The outdoor hotspring was great! First experience to be able to wear a swimsuit in a Japanese hot spring”. 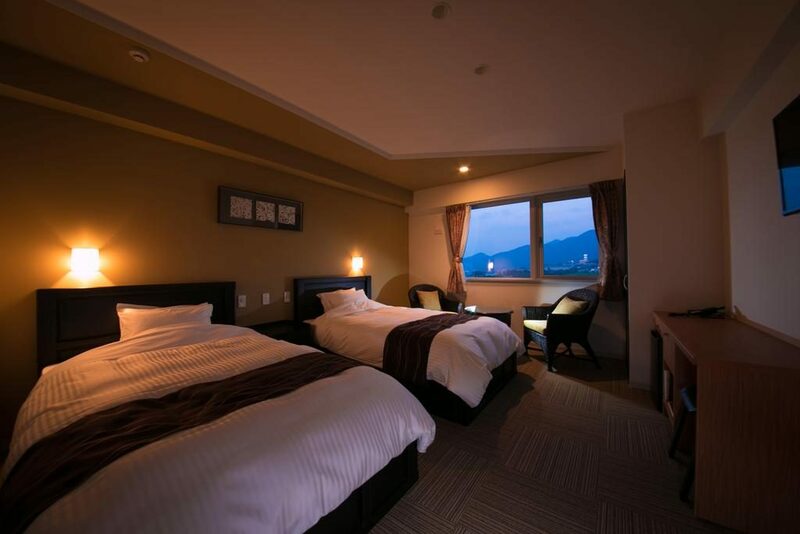 One of the most popular and most highly rated accommodations in Beppu, the Yamada Bessou is authentic Japanese accommodation at its stylish best. Traditional style rooms featuring flat-screen TVs, incredibly spacious natural hot spring baths, seating areas within rooms with large windows and garden views, and lovely tatami mats. Female guests are also offered the option of choosing their yukata robes to wear in the room. Whilst you’re there, don’t forget to reserve an outdoor hot spring bath for private use, or else you can simply hop into the public indoor bath which is available 24-hours a day. To top it off, book in a massage treatment after a long day of exploring. For breakfast, expect a delicious Japanese-style meal made with only the freshest of local and seasonal ingredients. This accommodation is located only 10-minutes walk away from Takegawa Onsen, and is only a few minutes away from Beppu Station. Why Guests Love It: “The place is very true to pictures. The staff was very welcoming and spoke English well. We were also lucky and had the outdoor onsen practically to ourselves the whole day!”, “Ideal location, only 5-minutes walk from Beppu Kitahama station. Staff speaks good English, and upgraded our room when they found out it was our honeymoon! Private outdoor bath is also a must-go”, “This ryokan is everything one would expect in a ryokan but without any artificial snobby-ness one often experiences at such places”. 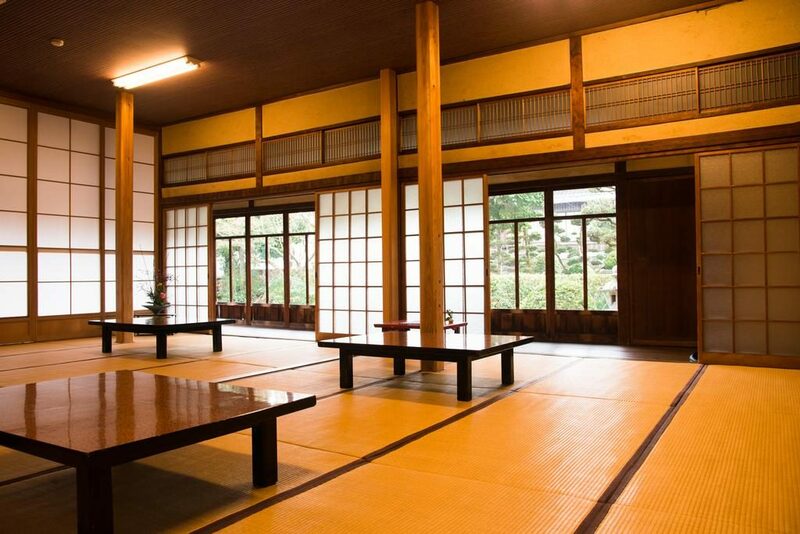 If you are interested, you will find more Ryokan recommendation here: Ryokan Japan. 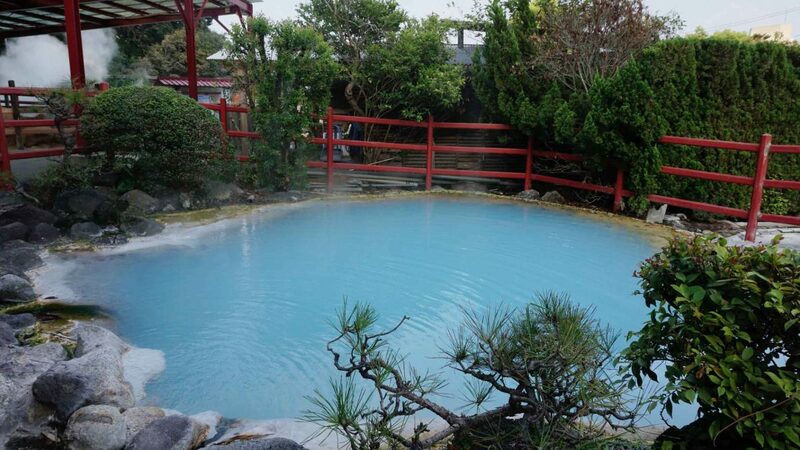 One of the most highly rated onsen districts in Beppu is Kannawa Onsen. 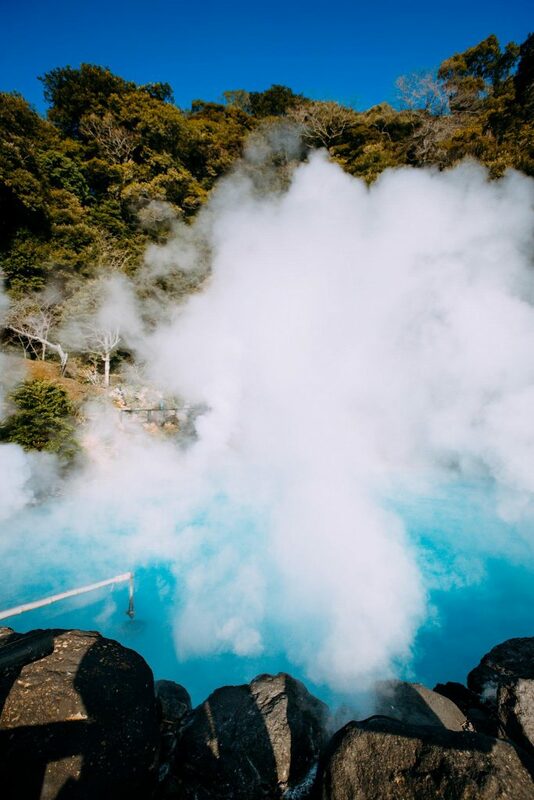 Given that Beppu is a city known for specifically for their hot springs, that’s a big call, but we know you won’t be disappointed if you give this place a visit. The onsen is directly built on the steaming hot ground, and thus it will be like bathing in a surreal mythical town that greets you with misty fog at every turn you take. At night, the buildings become lit, highlighting the fog in brilliant colours and making it quite a sight for sore eyes. Here, you will be able to enjoy many spring water baths, such as pure water, salt water, iron carbonate, stone baths, open air outdoor baths, and even waterfalls. 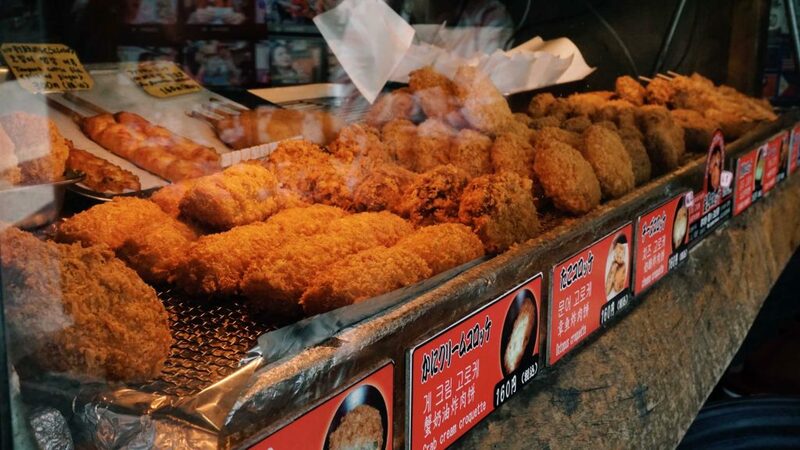 If you take the time to walk around and explore the area, you’ll come across tiny stores selling eggs and sweet potatoes steamed over the hot spring steam via wooden racks. If you can organise it in time, try and book a spot at the Hyotan Onsen, one of the most popular hot springs in this region. Otherwise, all other hot spring baths will provide just as good an experience. 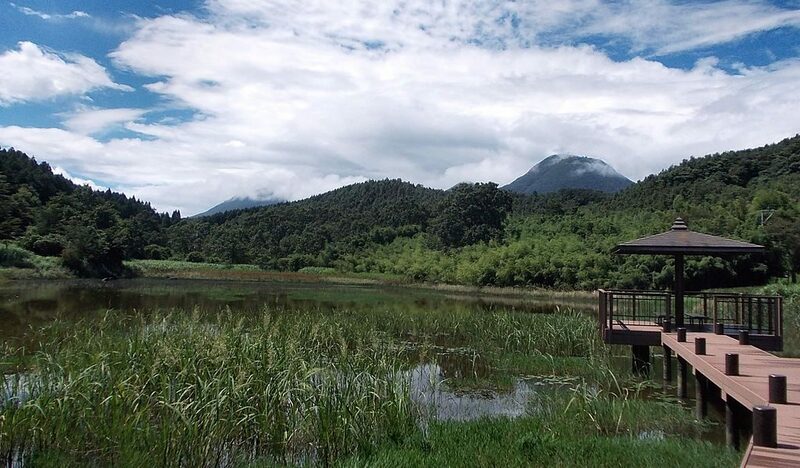 It will be hard to miss Kannawa – you’ll notice the area with a vast concentration of steam clouds from a mile away. Access: From Beppu Station, take any of the buses No. 2, 5, 9, 24, 41 and alight at Kannawa(25-minutes away). The upper region of Kannawa is the more tourist-centric region. First thing you’re bound to think when heading to Beppu is all the gorgeous onsens you’re going to soak into, surrounded by gorgeous trees, possibly overlooking the ocean, over and over again. But an experience that you may not have heard of, and should definitely pop onto your list, is taking the time out for a sand bath. Never heard of it before? 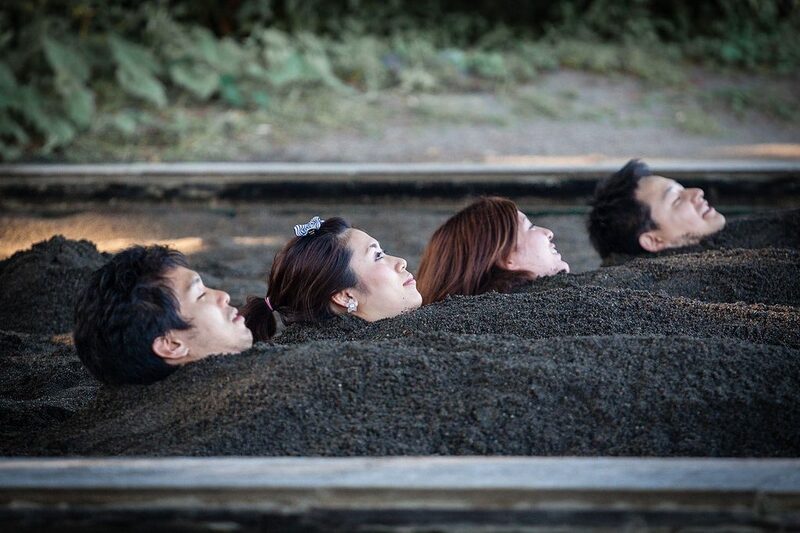 Well, basically, instead of soaking yourself in a steaming tub of fresh hot spring water, you’ll be buried up to your neck with black volcanic sand. Located on the beach of Shoningahama, which is next to the Beppu International Tourist Port, it’s the ultimate experience for those who are after a little something different. Fall asleep for a few minutes to the sounds of the ocean and wake up to the view of the waves crashing onto the beach right in front of your eyes – this is one you don’t want to miss. Access: From JR Beppu Station, take the east exit, take either the Kamenoi or Oita Kotsu bus and alight at Rokushoen bus stop. It is roughly 15-minutes, and will cost 230 yen. Jigoku mushi, the act of cooking food through the steams of the hot springs at the Hells of Beppu, is a very real and very popular activity in Beppu. 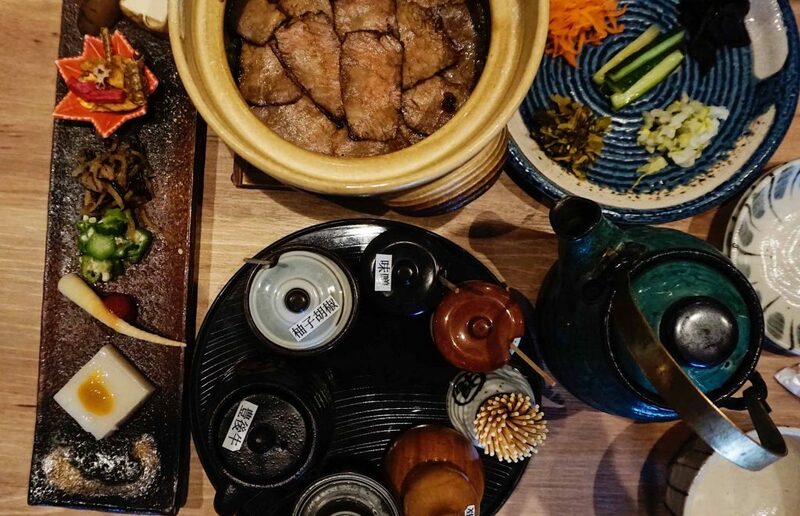 The Kannawa region of Beppu is not only famous for its hot spring steams that permeate throughout the entire village, but also for the volunteer-run classes that allow people to participate in steaming all sorts of delicious food. Whilst this cooking method had reached its peak during 1603 – 1868, it’s making a complete revival, with many visitors to the region saying it’s one of the most unique experiences they’ve ever participated in. How it works is that you can head to the Jigoku Mushi Kobo (within Kamado Jigoku), the centre where you can operate the steam cookers, and pick up their information fliers to learn just how long certain foods take to steam. Once you’ve noted down what you want to cook, you can head down to the supermarket about 10-minutes walk away (cheaper options and more variety) and pick up the foods, or you can purchase the foods at the stalls across from the Jigoku Mushi Kobo (they have less variety and are slightly more expensive). Once you arrive back at the Jigoku Mushi Kobo, purchase a ticket to use the steamers from a vending machine. Hand your ticket and food purchases over to the staff member. They’ll cut it into pieces fit for the steamer and will instruct you on how to use it. We highly recommend fish, shellfish and shrimps – super tasty! Also, vegetables usually don’t take too long, but potatoes take a bit longer. Beppu City is full of life and activities, but don’t forget to show a little love at Yufuin, the neighbouring city of Beppu. Whereas Beppu may lead Japan in the best hot springs, Yufuin is the friendly neighbor who offers great mountains to hike and delicious foods to fill your belly. 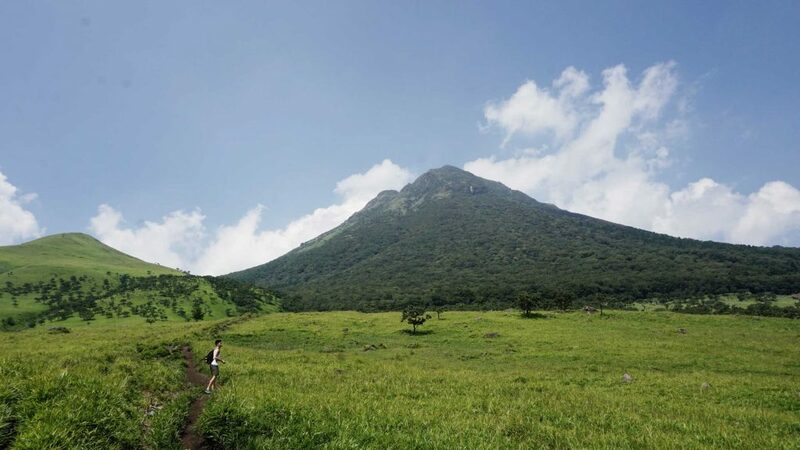 One of the most prominent hikes in Yufuin is Mount Yufu, a wonderfully diverse hike that will take you across flat plains, under towering trees, and up steep rocky platforms to views that are completely insane. The hike itself only takes roughly 4-5 hours, depending on your fitness level, so if you start a little early, you’ll have the rest of the day to explore the area. If you’re not down for the hike, you can also head to the base of the hike, where peaceful rolling plains will greet you, and take some gorgeous shots with the mountains in the background. Once you complete your hike/photoshoot, head to Yufuin City afterwards for some delicious Yufu-Mabushi, a specialty of the city in which you order either beef, eel, or chicken, and when it comes out served on earthenware pots, they will kindly explain to you the process of how to eat it: basically, you mix it up and try a small bowl without condiments, then you spoon more into your bowl and mix it with condiments of your own liking from then onwards. The last step is to pour the provided dashi-shiro into the pot when only the remaining burnt rice at the bottom is left, wait a bit for it to soften, and lap it all up!. Their dessert cafes are outstanding too! 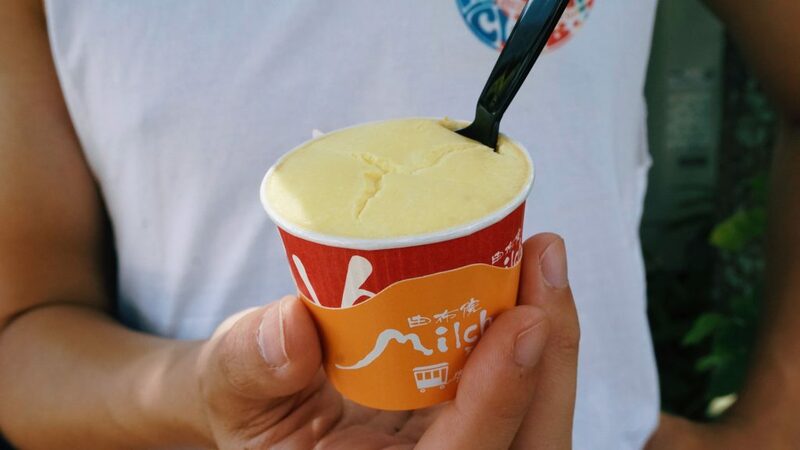 If you’re still not done, make sure you stop by Yufuin Milch for some warm cheese pudding (incredibly soft and delicious), and kincho croquettes for some mind-blowing beef, onion and potato croquettes (they also have plenty of other options like octopus croquettes and special karaage chicken skewers). The Hells are Beppu, as mentioned before, is one of the most popular attractions of Beppu City. You’d normally expect to be able to soak in the waters of the hot springs that you traverse across Japan for, but not in this case! The waters of the Hells of Beppu hot springs reach all the way up to boiling points (reference: you can steam food with that type of heat, as you’ve probably read above). Despite the fact that you can’t bath in these, again, they’re totally worth checking out. They’re spectacularly beautiful, showcasing aqua blue waters, tremendous steams, boiling mud and geysers. Jigoku Meguri (“tour of the hells”) is the name of tour that you can participate in yourself which will take you to visit all eight of the onsen – Umi Jigoku (Sea Hell), Shiraike Jigoku (White Pond Hell), Oniyama Jigoku (Devil Mountain Hell), Yama Jigoku (Mountain Hell), Oniishibozu Jigoku, Kamado Jigoku, Chinoike Jigoku (Blood Pond Hell), and Tatsumaki Jigoku (Tornado Hell). At certain onsens, there are ashi mizu’s (foot baths), where you can soak your feet. People typically drive or take a bus between the two areas where the onsens are located, but it’s possible to walk around 40-minutes between them. Access: From Beppu Station, you can get on a bus bound for Kamenoi (No. 2, 5, 9, 24, 41) and alight at either Umijikoku-mae or Kannawa. To get to the two that are not located in the same area as the others (Chinoike Jigoku and Tatsumaki Jigoku), you will need to take the number 16 bus from Kannawa and alight at Chinoikejigoku-mae bus stop. As mentioned above, Hyotan Onsen is located at Kannawa Onsen, and is one of the more popular places for people to head to for their Beppu onsen experience. Why, do you ask? How is this onsen better or different from the other onsens? Well, whereas the quality of the water and service may be the same, the overall experience of bathing at Hyoten Onsen may be more memorable because, if you organize it early enough, you might be able to book in one of their ‘family’ onsen rooms for an hour of use, where families, couples, and friends can relax in an onsen in their own privacy. 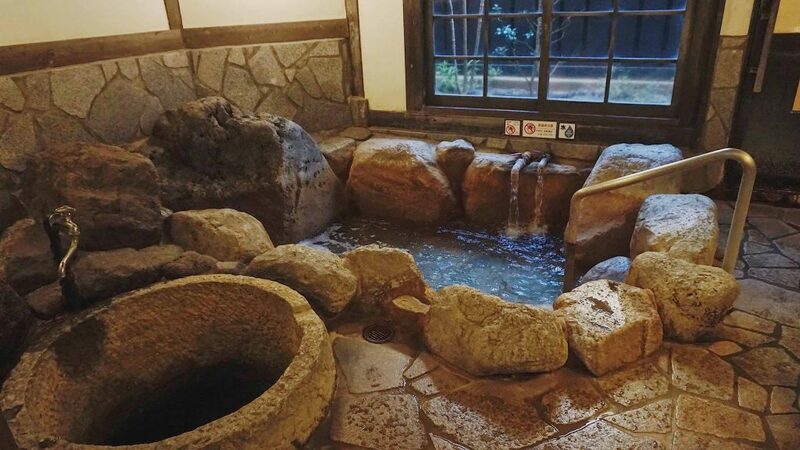 Whilst this isn’t unheard of, private onsens for one-day personal-use are few and far between, and none are more welcoming to foreigners than Hyotan Onsen (all above factors just add to their popularity). It’s incredibly easy to organize; all you need to do is call their contact number one week ahead of your planned trip there, and request a family onsen room. There are eight to choose from (which you can peruse on their website). When you arrive, head to the reception and let them know that you’re here for your reservation. You will need to purchase a ticket from the vending machine, after which you’ll exchange it for a basket of the key to the room and an instructions booklet. Towels are available for rental for 100 yen each. 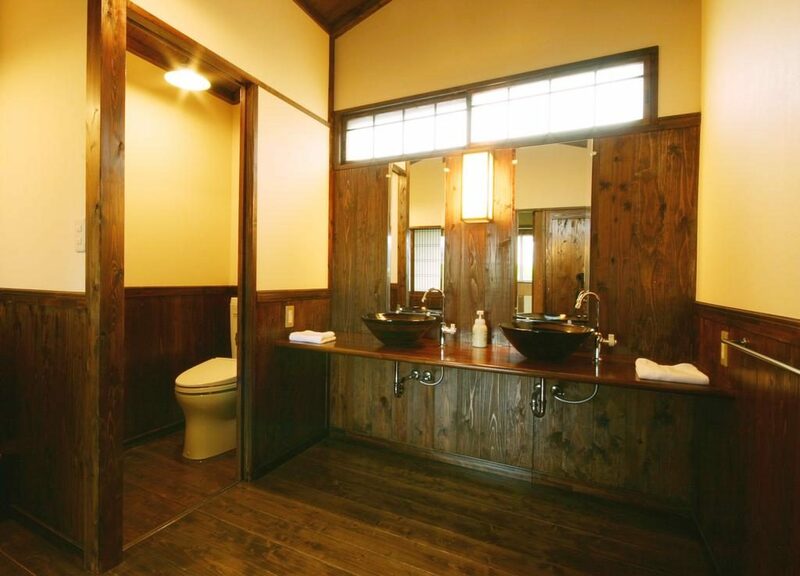 Once you’re done, simply unplug the onsen bath, get changed, and return everything to the reception. If you don’t plan on bathing in an onsen, you can also head there to use their renowned foot baths also. Access: From Beppu Station, hop on a Oita Kotsu bus (from the east exit of the station) towards Kannawa Onsen, and alight at Jigokubara. It’s a 3-minute walk from there. There is also free parking onsite. If you thought a small city like Beppu would not have night views that take your breath away, you thought wrong! Beppu’s very own Global Tower, a modern high-rise building in the middle of the city that offers sweeping views of the surrounds. It sticks out like a sore thumb amongst the rest of the low rise buildings in Beppu, however, this is a blessing in disguise, as when you get yourself up there, there will be nothing and no one to obstruct your view. Located just a 25-minute walk from Beppu Station, or a 10-minute bus ride away, visiting this observation spot makes for a nice date idea, or for a relaxing night activity after dinner. 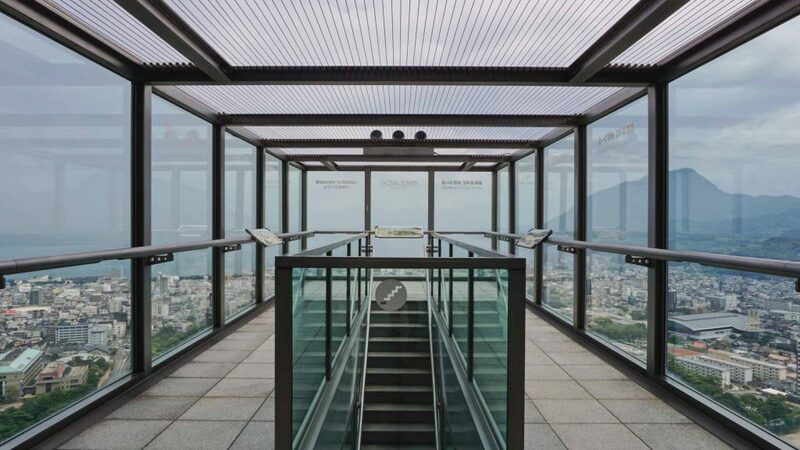 The entrance fee is surprisingly cheap, and the moment you arrive at the top, the view you see when you step into the glass box that overlooks Beppu City will take your breath away. Seeing the mountains in the background, steam rising from onsen villages, and the inoffensive lights spread out across the city (at night) will make you want to bottle up the moment and take it home with you. During the day, the vast stretch of the city meeting the ocean is just amazing. 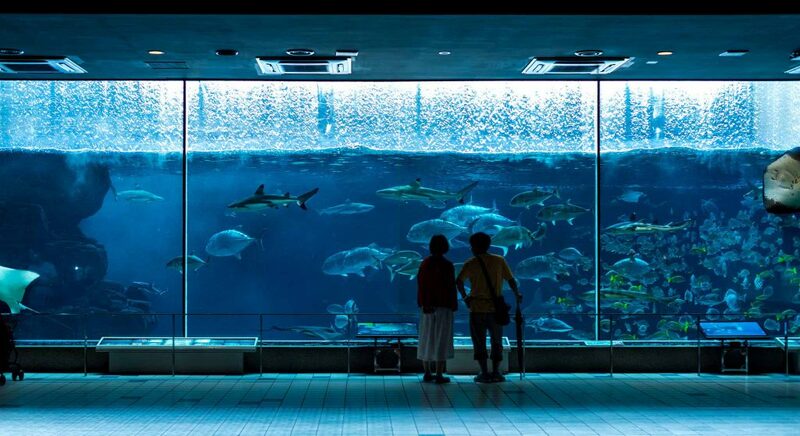 If you’re after an activity to do with your friends or family (especially with little kids), spending some time at the Umitamago Aquarium, located just outside of Beppu, is a wonderful activity to do. Unlike many of the aquariums that you’re use to, this one has been built with providing a unique experience mind. The interesting architecture and display methods throughout the aquarium will have you ooh-ing and ahh-ing much more than you think, even if you’re an aquarium veteran. Expect to see the likes of penguins, dolphins, seals, and otters, and of course, a variety of fish that you may have never have seen before that are region-specific! Access: From Beppu Station, take bus no. AS60 or AS61 bound for Oita Station and alight at Takasakiyama-Umitamago. The ride should take roughly 10-minutes and will cost 410 yen. Mount Tsurumi (Tsurumidake) is a 1375m high mountain that overlooks Beppu City. If you take the ropeway up, you will be deposited at a small park near the summit of the mountain, which offers visitors multiple different observation decks that feature sweeping panoramic views of Beppu and Oita City, Mount Yufu, and even as far as the Kuju Mountains (located along the Yamanami Highway that extends from Beppu to Aso) on a good day. Aside from the observation decks, there is a small network of walking paths that you can take to explore the mountain shrines, and if you’re willing to walk 15-minutes, you will reach the actual summit of Mount Tsurumi. Of course, there is also the option of skipping the entire ropeway and hiking up the entire mountain from the lower ropeway (this will take 2-hours), but if you’re looking to save some time, the ropeway is the way to go. The best time to visit this mountain is during the cherry blossom season, around mid-April. It is super popular amongst locals as well, so prepare for the crowds. Access: From Beppu Station, take bus no. 33, 34, 36, 37, and alight at the Beppu Ropeway lower station. This ride is roughly 20-minutes and will cost 420 yen. Hours: 9:00am – 5:00pm (closes at 4:30pm from mid November until mid March). Everyone loves a good fried chicken. It’s like its in our DNA! And if you’re searching for a good meal to have, look no further than toriten, the tempura-style fried chicken that originated in Takeda (another city within Oita), that has expanded its famous recipe all over the region. If you’re staying in Beppu, a short 15-minute ride to Oita station will land you at the one of the best toriten restaurants – Takeda Marufuku. Here, there is no English menu, but there are enough pictures to get you by. If you ask the server for ‘toriten’, they should be able to point out the popular ones for you. 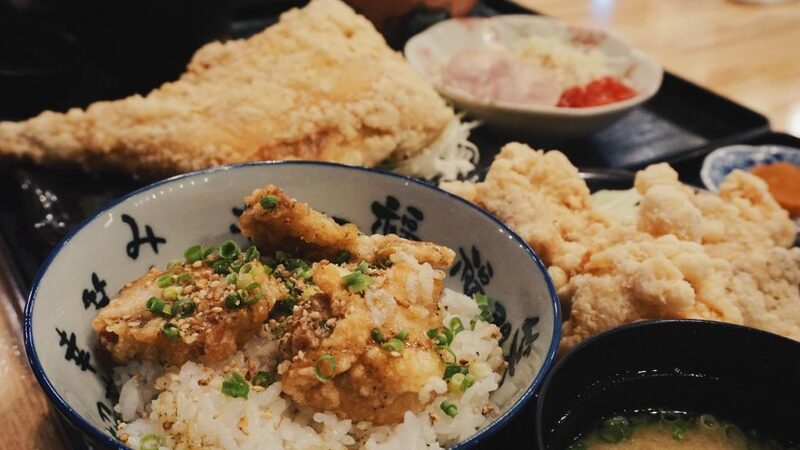 We highly recommend requesting a side of their ‘shisho’ sauce, which is a tangy citrus sauce that is sublime and goes so well with the fried chicken. Access: From the station, take the exit where there is a travel agent, and turn right. Enter into the shopping centre on your right (only a few metres away), and look for the restaurant with plenty of chicken options on your left. Beppu is a city that you would initially come for the hot springs, but discover that there is superbly unique culture to explore and learn about, and it might surprise you as being the most memorable leg of your trip! Why not pack your days with full mountain hikes, cooking fish in wooden baskets over steam from the ground for lunch, soaking in a hot spring afterwards (or a sand bath! ), and then relaxing with the views of city at the Global Tower? That sounds like the perfect date idea! And for more tips about traveling in Japan, check also these articles: Japan Travel Blog. Travel During Winter in Japan – 6 Reasons Why It’s a GREAT Idea! Real Life Mario Kart in Tokyo Japan - All you need to know! Robot Restaurant Tokyo - A Must-Try Attraction in Shinjuku Japan!